April 30, 2012 was the last day of my former life. On May 1st we received a phone call telling us the baby I was carrying had a 1 in 3 chance of having Down syndrome. That meant out of 3 pregnant women with the same prenatal testing results as mine, 1 would have a baby with Down syndrome while the other 2 would not. I was stunned. I was confused. Angry. Scared. Sad. Devastated. Name a negative emotion and it is highly likely I felt that. I cried. A lot. 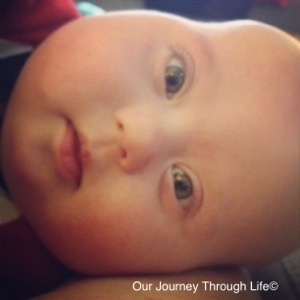 We prayed every day that our baby would not have Down syndrome. That we wouldn’t be the 1. As you all know, we were the 1. Our baby does have Down syndrome. 365 days ago I thought that meant I was the unlucky one. You know who is unlucky? Those other 2 women who don’t get to experience the overwhelming love I feel when looking into my son’s beautiful almond shaped eyes. Those 2 aren’t lucky enough to be a part of this oh so special club I’m a part of now. They didn’t get the opportunity to “meet” new friends and develop amazing bonds with people who share in a kinship like no other. The other 2 weren’t lucky enough to be shown the world from a totally new perspective. A kinder, gentler, more accepting, less judgmental way of life. The colors that surround my world are more vivid now. My eyes have been opened. I am the lucky one. I am no longer sad, scared, or angry. Those feelings have been replaced with happy, hopeful, and joyful. This time last year, I was just going through the motions. Now I try to truly live and appreciate this life. My life. The one God has mapped out for me. For us. For my family. Sure, it hasn’t been all peaches and cream. Eli has not had an easy start. But his strength inspires me on a daily basis. I witness his perseverance. He amazes me. I have learned so much from him yet he is only 6 months old. I am so excited for the road ahead of us. Yes, it is the road less traveled – but I am one of the fortunate few who get to go on this journey. Yep, I am the lucky one.